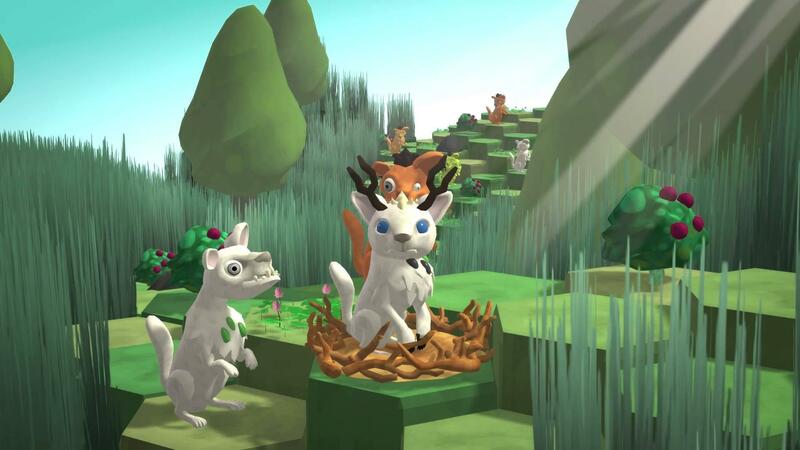 Thanks to a GOL supporter I've had a chance to check out 'Niche - a genetics survival game' [Official Site, Steam] and breed my tribe of weird looking animals. I am pleased to say that so far the Linux version looks pretty good, I haven't encountered any issues other than my own confusion on just what is going on. You're essentially controlling a tribe of animals, and you need to breed them using different mixes of genetics to survive the environment. You will come up against predators, diseases and so on. You will also find new wild animals which join your tribe once found, you can then mate with the newcomers and see what happens too. I'm not entirely sure what I'm doing as the game offers no tutorial or help text of any kind, something I am hoping they vastly improve upon during development. It seems you need food to do an actions like movement or looking ahead at tiles, my tribe rather quickly all died from starvation it seems. You lose the game by being wiped out. It's a really cool idea, but it does need a lot of work in helping players understand what exactly is going on. At one point my first newborn died, I have no idea why, the game didn't tell me he died, he just seemed to suddenly be dead from one turn to another. Sounds similar in concept to Spore (Maxis), there's potential for this to be a cool game! Your primary resource is food, your secondary resource is animal lifespan, and your tertiary resource are genes. For every action (gathering, fighting, moving, uncovering tiles, mating,...) that any animal takes you'll need one food unit. If you don't have enough food, the lifespan of said animal will be reduced instead, just as if the animal would have been harmed in a fight. There are two food sources: gathering and hunting. Depending on the genes an animal has, it can be better suited for either of those tasks (or just be bad or great at both...). You'll want your best suited animals do the gathering/hunting, as they will output more food units per invested food unit. Other traits help your animals defend the herd from predators (or even hunt those fearsome carnivores). In order to have the best chances of survival you'll want to breed animals with useful genes, but you'll have to be careful about the immune system genes, as having a small variety of those will make your herd susceptible to disease. While talking about disease: The terrain has effects. Moving through swamp has an increased chance of your animals getting sick (reducing their lifespan). Looks like an interesting game, otherwise. I was expecting early access after the trailer, but I think I will wait a bit before trying it. In addition to the info soulsource provided: you also have to manage your territory and its traits. Moving through grass (unexplored tiles) is more costly, in effect reducing the range your creatures can travel. Tall grass also covers the movement of other critters, so it is beneficial to invest food into discovering tiles. I'd say nests can be regarded resources as well. Your livestock can mate anywhere on the map, but the females need a nest to give birth on the next turn and the newborn needs the nest during infancy. So you'll plan your reproduction a few turns ahead by queuing up pairs of animals near nests while juggling food, lifespan and actions on each one. Speaking of limited actions: each individual may perform up to three actions per turn. For the breeding part with the different genes the parents provide: you select genes to have a higher chance of being present in the child. You might want to focus on two traits that help specialize your tribe for example, by preferring long ears for better environmental perception and berry gathering paws to increase income per action spent on a food source. As long as those traits are present in at least one parent, it's pretty sure those selected perks carry over. You might also want to keep negative effects out of your breeding strategy, so you might not want a blind creature mate with one that is prone to catch diseases. All in all this does not resemble Spore at all in my eyes. This looks like something I would nave 0 interest in playing, a nightmare world Catan where pieces jump hump in place at high speed. Weird. Thanks for the comments guys, crazy to release such a game without even hinting at any of this. I know some games have an element of figure things out for yourself, but more complex games like this need explanations. nlla a nice grasp of some evolution and genetics concepts. Looking good! I follow it for a long time. Reminds me a Creatures on hexagons... Still not sure if it's "fun" enough at this point, but i love the concept.